It rained for the first three days of our visit to Prince Edward Island. We know that entertaining ourselves on rainy days will be a problem as we are “go outside” people and a lot of what we (especially Arch) like to do means being outside. So, after a spectacular summer of very little rain, this was our first real test. And, as we must stay on budget, we did not want to spend any unnecessary money. The solution? A food hunt for our dinner. PEI issues a brochure “PEI Flavours Culinary Trail”. I found a recipe for PEI Lobster-Stuffed Spuds in it so we decided to follow the trail along Green Gables Shore and gather the food necessary to make them for supper. First stop: Island Farmhouse Gouda to buy The Cheese Lady’s Gouda. They had an interesting video about how the Gouda was made and a glassed in area where we could watch the process happening. 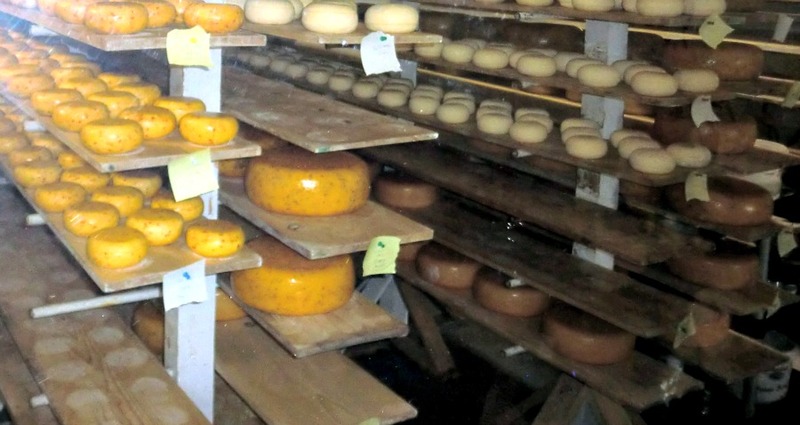 Unfortunately, when we were there, The Cheese Lady was not at work, so all we saw were the Gouda aging – a little like watching grass grow. 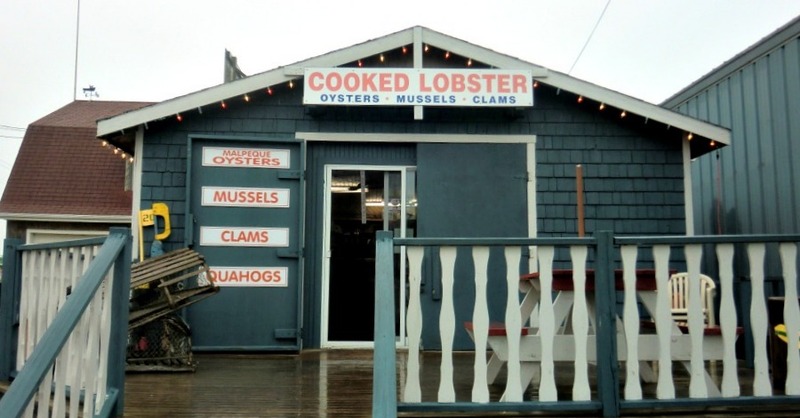 Next stop: Fishermen’s Wharf in North Rustico to purchase lobster and, we hoped, have lunch at the Blue Mussel Café. Again, we are here out of season so there wasn’t much action. 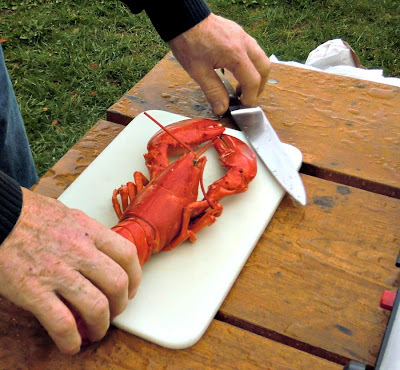 The café was closed, but the lobster pound was open so we were able to get our lobster already cooked. Lunch: So now we are on a hunt for a spot to have lunch. There was a Fisherman’s Wharf Lobster Supper restaurant there but these places tend to be very production (vs. quality) oriented and as buses from cruise ships visiting Charlottetown lined the road we decided to pass. Our brochure recommended a spot in Cavendish so on we went. Chez Yvonne sounded like a small, cozy café but when we arrived we found this. With more buses parked in back. But we were pleasantly surprised. The bus people left as we arrived and the restaurant was very quickly tidied up and we were seated. The food was all homemade and both it and the service were excellent. So then, on to get some mussels for Arch (I do not care for them) at Carr’s Shellfish on the wharf at Stanley Bridge. This is where the famous PEI blue mussel comes from and the waters around Stanley Bridge are full of mussel (and oyster) farms. 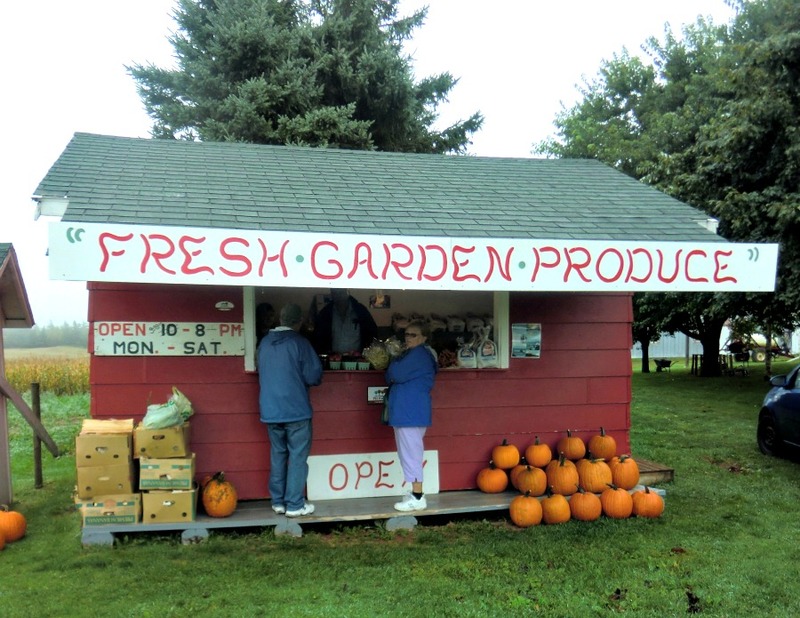 Finally, one last shop at Hills Farm Stand to purchase two really nice baking potatoes. Another disappointment as they only sold potatoes in 5lb (or larger) bags. 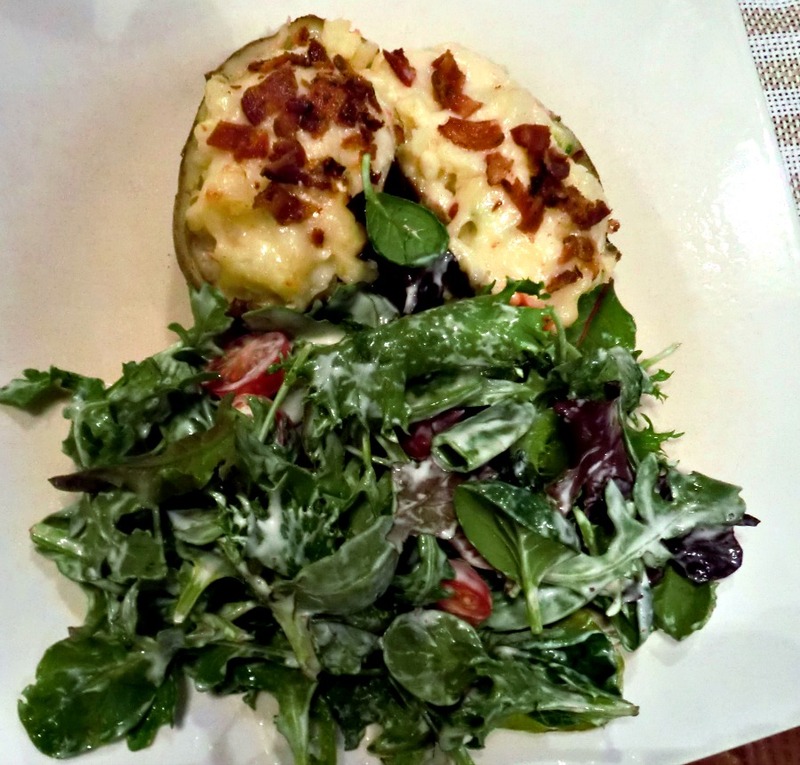 We wouldn’t eat that many potatoes in a month and had no place to store them anyway. So we passed on that and went to a grocery store where we were able to buy two potatoes (grown in PEI). Then home to make supper. Arch shelled the lobster and scrubbed the mussels, we popped the potatoes in the oven to bake and I prepared the ingredients for the stuffed potatoes and the mussels. 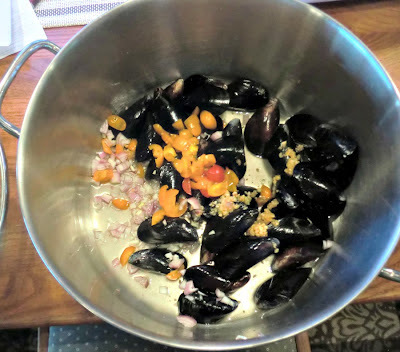 For the mussels I simple added a little chopped garlic and onion, a bit of white wine, some chopped tomato and a tablespoon of butter. Place them on the burner for about 5 minutes, until they open, and voila: steamed mussels. Cut the cooked potatoes in half and scoop out the potato. Set the skins aside. In a bowl mash the potato with the butter, sour cream, green onion and ½ the cheese, Beat until smooth. Fold in the lobster meat and bacon. (I simply mixed it all together with a spoon). Season with pepper and salt. Spoon the mixture into the potato skins, sprinkle with the remaining Gouda and bake for about 15 minutes, until hot and cheese is melted. They really were delicious and the recipe is a keeper. I saw in one of your earlier blogs that you were looking for a web camera. Check out GoPro camera at GoPro.com. Chuck Woodbury, the editor of RVtravel.com, has been posting videos on Facebook with it as he travels across the US. The Rich Really do Live Better Than You and Me!